Images of the PSP2 development kit have reportedly leaked out, confirming some of the new handheld's new features. Sony's successor to the PSP, dubbed the PSP2 for now, exists, this much we know for sure. Details on the handheld are still secret, but newly leaked photos of what is reported to be a PSP2 development kit may confirm a few of its abilities. 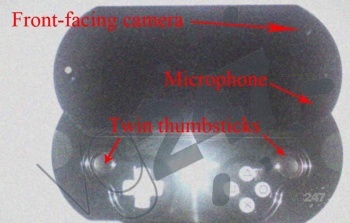 VG247 confidently states that these are genuine photos of a version of the PSP2's development kit. While these photos show a sliding design similar to that of the PSPgo, they evidently aren't of the handheld's most recent development kit which is one solid block. Keep in mind that the system's form isn't final until Sony officially announces it. 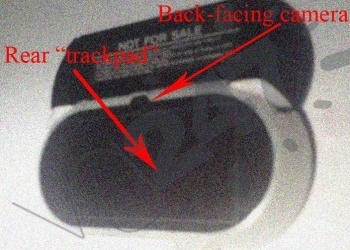 However, these photos do show off some of what the PSP2 will be able to do, if real. It has a rear trackpad, as rumored, in addition to dual analog sticks. There are cameras on both the front and back, just like with the Nintendo DSi, and it also has a microphone to yell in and an HD screen. More information about the system's internal capabilities hasn't been released, so its rumored level of extreme power still can't be confirmed. Most of the other rumors surrounding the device have turned out to be true, so don't be surprised if Sony ends up putting a mini-nuclear reactor in our hands with the PSP2. The most intriguing aspect of the PSP2 to me is the rear trackpad. In my mind, it could allow for some kind of touchscreen control while also becoming a button that can be tapped when using the dual analog sticks. Whatever it ends up being used for, I hope it'll be interesting. According to rumors, the PSP2 could be released as early as the holidays of 2011, so expect an announcement around E3 next year.